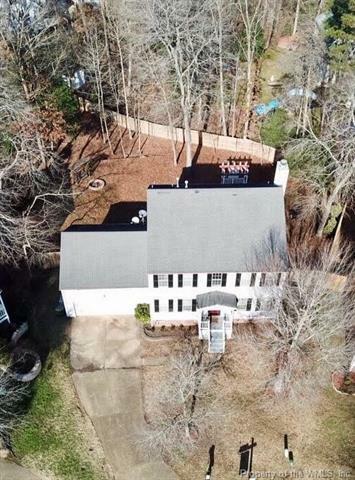 This Colonial Style home is nestled in a family-friendly community, in a cul-de-sac, of Village Square, upon entry you'll find hardwood Bamboo flooring, vaulted ceilings in the foyer & column accents, formal DR to your left & sitting area/ office space/ flex room to your right. Home features crown & chair molding & elegant trim throughout, including around the gas fireplace & above the entryway. Enjoy views of the impressive back deck & huge backyard, including swing and fire pit from the bay window. Great for entertaining. Spacious Master Bedroom with WIC & 3 nice sized additional bedrooms. All new updated Master bathroom with dual elevated vanity and flooring. New elevated vanity in hallway bathroom. new water heater. 2 car garage with lots of storage. Conveniently located by schools, shopping, Kidsburg & Route 199. Make this charming home yours today! Seller willing to provide HOME WARRANTY w/ acceptable offer.